Former Ryder Cup player Paul Way, pictured, will be guest speaker at a special event that will mark the culmination of the 2018 DF Communications Business Golf League. The final of the competition, involving 12 companies, will take place at Trump International Golf Links (Scotland) on Thursday, September 20 (2018). After a day of golf on the famous course to decide the champions, all finalists will enjoy dinner – and insights from Way – at the highly regarded MacLeod House. 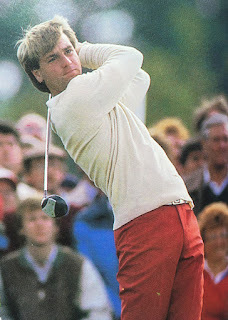 Way first represented Europe in the Ryder Cup in 1983 and was on the winning European team at the Belfry in 1985. His record was six wins, two losses and one halved match. His last top 100 finish in the sport’s Order of Merit was in 1993. After 1997 he played relatively few tournaments, but returned to the spotlight in the European Seniors Tour in 2013. Funds will be raised on the day for a children’s charity. As with previous events, the winners of this year’s tournament will select the charity to benefit in the 2019 competition. Last year’s winners, electrical services business SKN, are also taking part this year. Of the 36 companies competing, 17 are in the oil and gas industry. Aberdeen-based DF Communications, an award-winning mobile phone and communications provider to small, medium and large businesses, is the organiser of the north-east league for a seventh consecutive year. Since April, companies from across the north-east have been playing in group matches to earn a place in the final. Six teams are taking part across six divisions – the first games were held at Trump International Golf Links but the qualifying phases are being hosted by a number of local courses. The winners and runners-up from each group will go through to the finals, where they will compete in a stableford format for the title. This year’s nominated charity is Northsound Radio’s Cash For Kids. For further information on the league, which has been running for more than 15 years, visit http://www.golf.dfcommunications.com.